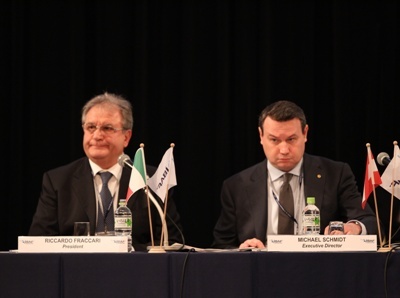 Riccardo Fraccari will lead the International Baseball Federation (IBAF) for the next term. The reigning President was elected unopposed during the Congress in Tokyo. Also the 3 Vice Presidents and the Secretary General were elected unopposed, after a series of nomination rejecton. Alonso Perez (Mexico) is the first Vice President, Tom Peng (Chinese Taipei) is the second Vice President and Antonio Castro (Cuba) is the third Vice President. Israel Roldan (Puerto Rico) has been confirmed as the Secretary General. Angelo Vicini (Republic of San Marino) prevailed over Rení¨ Laforce (Belgium) in the ballot and is the new Treasurer. More ballots were needed for the election of the 3 Members at Large. Paul Seiler (USA) prevailed over George Gladig (Switzerland) for the first chair. Masaaki Nagino (Japan) was elected second Member at Large over George Gladig. Luis Melero prevailed (again against George Gladi) and is the third Member at Large. Jorge Otsuka (Brasil) for the Americas, Lee Byung Suk (Korea) for Asia, Ishola Williams (Nigeria) for Africa, Jan Esselman (The Netherlands) for Europe and Ron Finlay (Australia) for Oceania have been approved by the Congress as Continental Vice Presidents. President Riccardo Fraccari and the Executive read a public Message of Oath before sitting for their first meeting. "We are aware for the great responsabilities that we are facing" commented Fraccari "It is a key momenti in the history of the game. The next 45 days will be very important for our future. Secretary General Israel Roldan also wanted to address the Congress: "I want to thank you for trusting me and giving me your vote. It is the time to stand as one for the sake of the game we love"